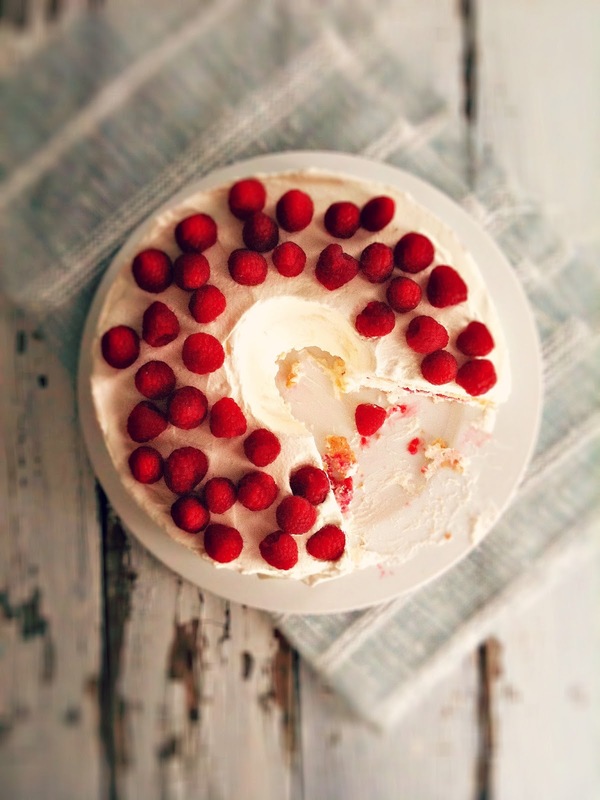 Let's usher in spring with a pretty cake, shall we? Well technically it is spring, but in my neck of the woods there are still five foot snow banks in the front yard and flakes of snow not willing to give up just yet. And so while we are waiting for warmer temps and the Great Spring Melt - my spirit doesn't care. It has launched into the new season with abandon. Many of you know that the last few months have been rather difficult for me, to put it mildly. I am more than ready to kiss this season of the brokenhearted goodbye - along with all of those heavy, dark, sad days. I'm ready for the fresh starts and bright hopes that springs brings with it. I'm ready for rubber boots and rain showers. I'm ready for longer days and a lighter heart. I am ready. 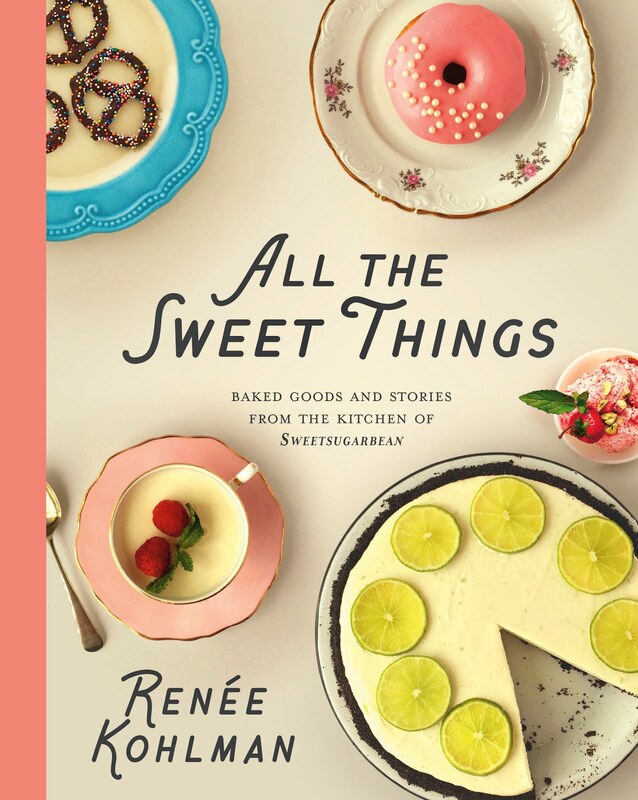 Back-to-back cake recipes in the month of march?! What can I say? I really like cake. And I had a dozen egg whites to use up from making this tart and this curd. They were frozen, but I didn't want to keep them in the freezer too long. Plus there was an early Easter celebration with my sis and her girls and it is my duty as their favourite auntie to supply them with as much cake as possible. My mom offered up her recipe - one she has made for years and years. There's technique to this cake, and a few simple rules but it can easily be whipped up on a lazy Sunday morning, just in time for an Easter feast. So, let's get going! Find your tube pan - but be sure it has a removable um, tube, otherwise this cake won't work. DO not get any grease near the pan, and be sure all utensils haven't come in contact with grease. This is a grease free recipe! There are a couple of special ingredients required, like Cake Flour. You MUST use cake flour. Don't sub in all purpose or your cake will be too heavy - not angel food light and the name of the game here is baking a light as air cake with crumb that will almost melt in your mouth. Also, cream of tarter will help your whites whip up mightily. I added a little almond extract into the whites just for fun but vanilla would be decent too. Oh, before I forget - your whites MUST be at room temperature. Cold whites are a no no. Sheeesh. I'm bossy with these cake rules! Ok, now we beat those egg whites, gradually adding sugar until we have high, glossy peaks. So pretty, I had to take a picture. The cake flour will be sifted with more sugar and gradually folded in to the whites. I did this is in four fold - in intervals. Folding takes time and a gentle hand. Once the batter is smooth and even, pour it into your grease-free tube pan. Take a sharp knife and cut through it a few times. Sounds weird but mom says this gets rid of air pockets, and wouldn't you know, my cake had no air pockets. Win! 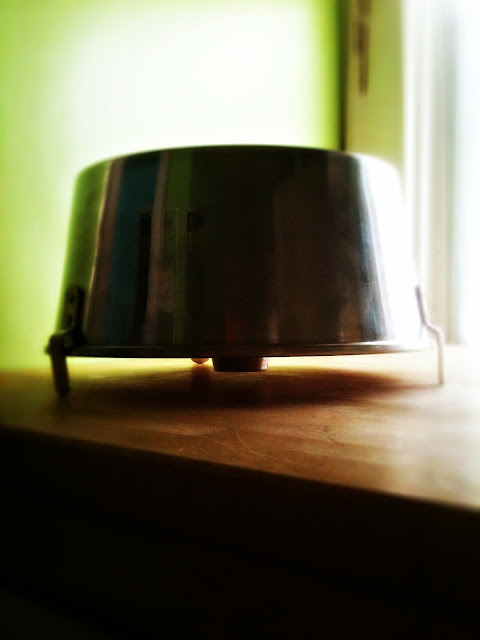 Carefully invert the cake - now I know what those little pointing things on my tube pan are for. Let it cool completely, then remove the tube. 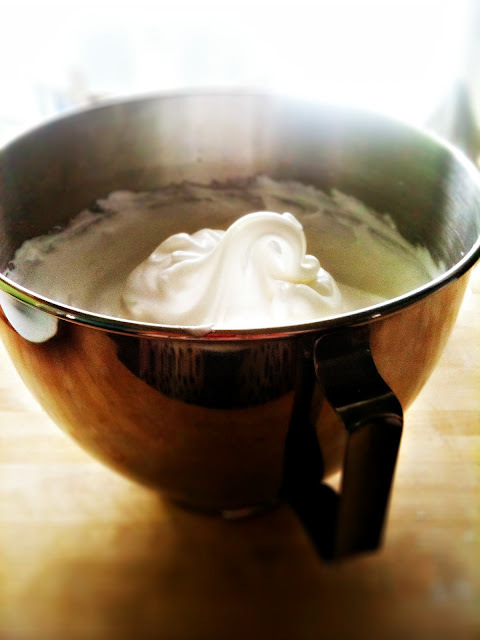 Whip some heavy cream - again keeping with a theme I added almond extract. 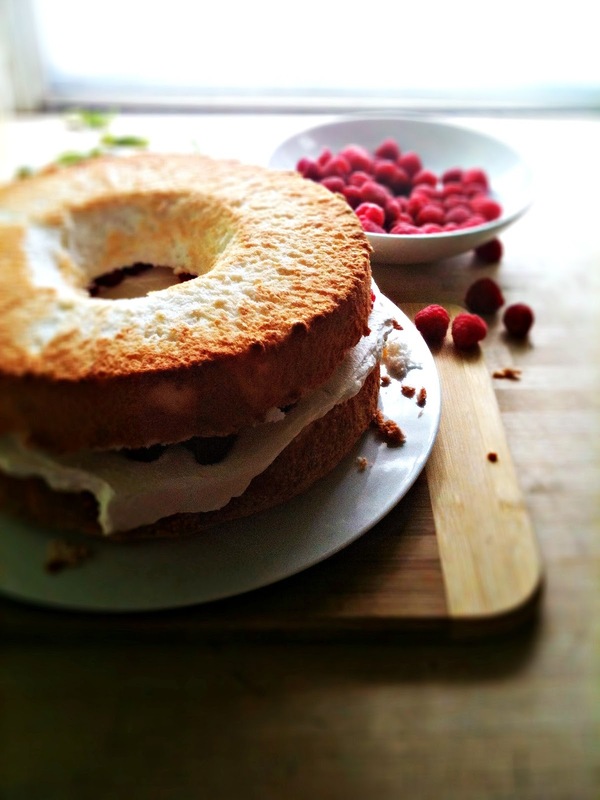 With a serrated knife carefully slice your cooled cake in half and fill it with the cream and fresh raspberries, or a mixture of your favourite berries. If you are lucky enough to have the season's first strawberries - do it. Top with the other half (obviously) and here you have the choice to leave it kind of naked and pretty or go all the way and completely cover it in delicious cream. I'm a bit of a whipped cream fanatic and I know two little girls who are too, so my choice was easy. If you are wanting a whipped cream alternative - check out this recipe for coconut cream, which looks pretty amazing and something I must get into my life. Chill your cake for about an hour before slicing. It will allow the flavours to set and the filling to soften. 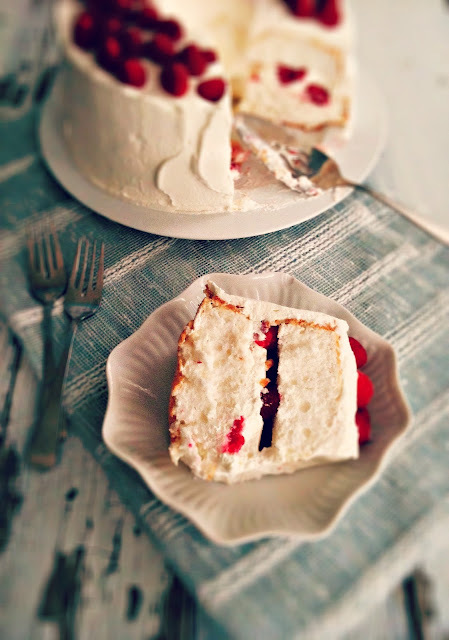 I couldn't believe how white this cake is - and the crumb has that perfect angel food texture. Raspberries and sweetened whipped cream made it so yummalicious I'm trying to find ways to have a surplus egg white stash again. So happy spring my friends. I hope wherever you are these early days of the season are treating you well. There's nothing like a new beginning. In a medium bowl add 1/2 cup sugar to the flour and sift 3 times. Set aside. 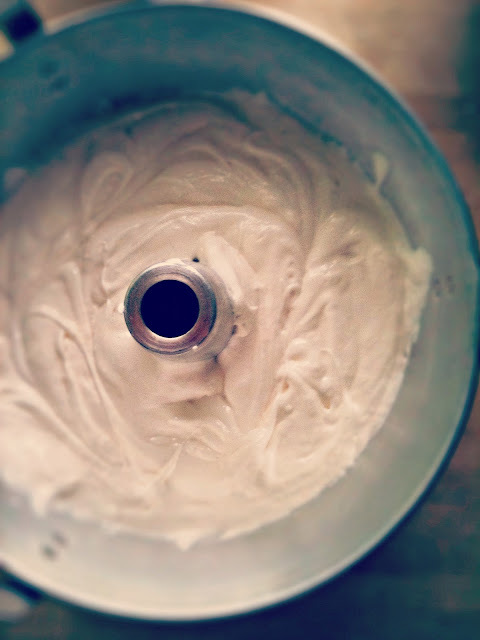 Add salt and almond flavouring to the egg whites and beat in a mixer until foamy. Add the cream of tartar and beat to medium stiffness. Then gradually add the cup of sugar and beat until it forms stiff peaks. Gradually fold in by hand the flour-sugar mixture - I did this in 4 intervals - and pour into ungreased tube pan. Cut with a sharp knife to remove air pockets and bake for 30-35 minutes. Invert pan and cool completely. Whip the heavy cream with the sugar and almond extract. Slice your cooled cake in half, with a serrated knife and spread cream on the bottom. Top with berries. Cover cake with cream and top with berries. Chill for one hour before slicing. Serves 10. Gorgeous photos Renee! I'm ready for spring too! Beautiful! 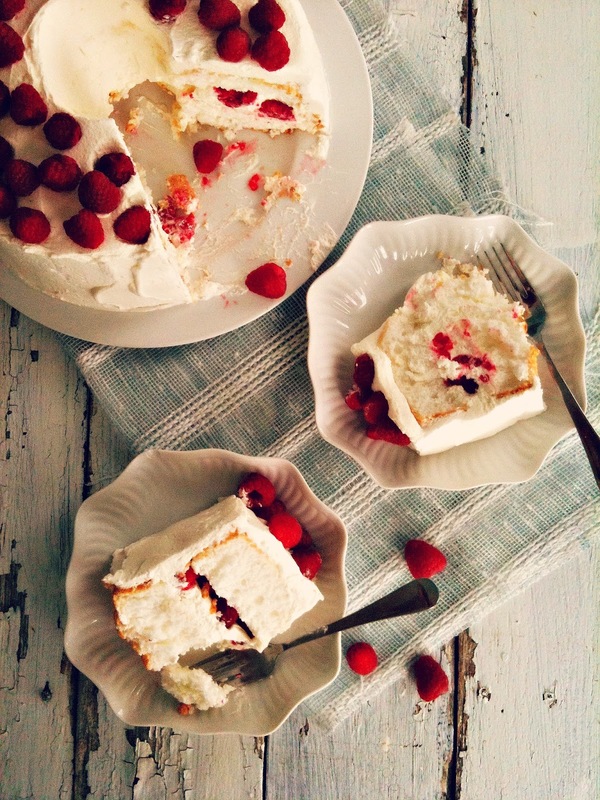 I am such a fan of angel cake. 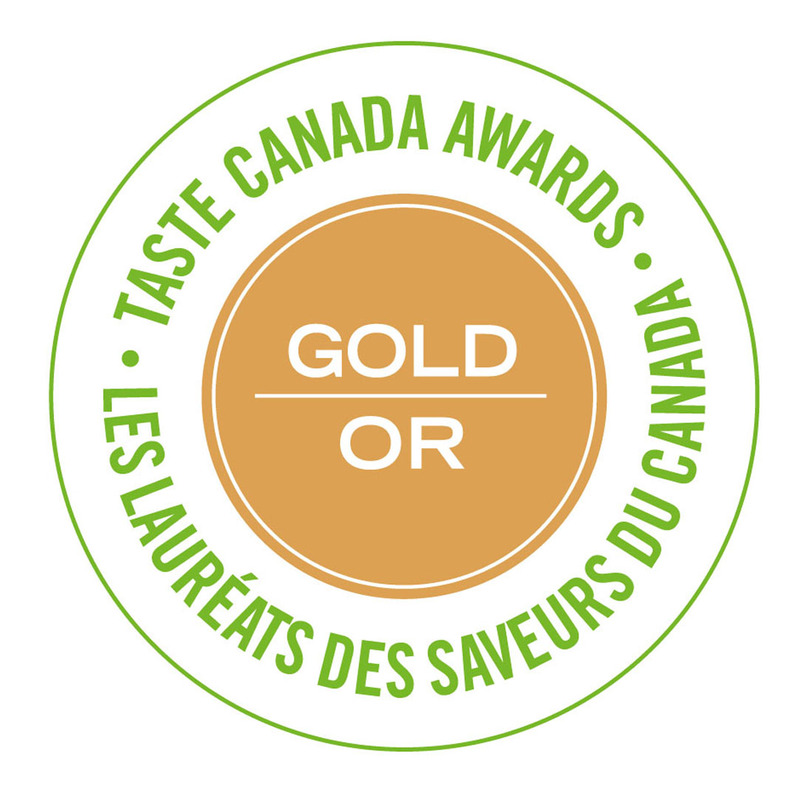 It is delicious, light and naturally low fat (can't say that for a lot of cakes ;) Yours is beautiful and I love the raspberries to welcome Spring, which hasn't arrived in Central Ontario either, btw (although I'm pretty sure HV will be snow free by the time you visit in a couple of weeks). 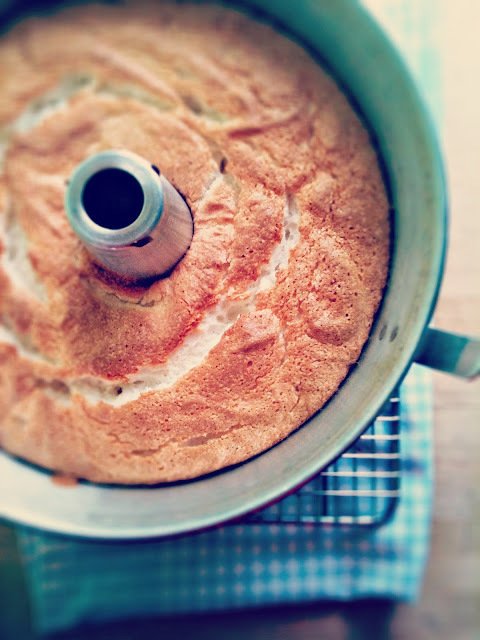 I am a huge fan of Angel Food Cake, and this one looks so lovely! Happy spring! Jennifer - I love that angel food is so low fat, means there is room for more whipped cream! I hope to see you at HV in just a few weeks! Jess - thank you. Happy spring to you too! Sadly, no HV for me. I have a work commitment that weekend. You will have a great time, though. It's a beautiful resort. Hoping to make the next one. Mmmm... I love angel food cake and I usually don't like cakes. I have tried making it before... you make it looks easy. I'll have to try again because you dessert looks so good! Happy Spring! Thanks for the great instructions. 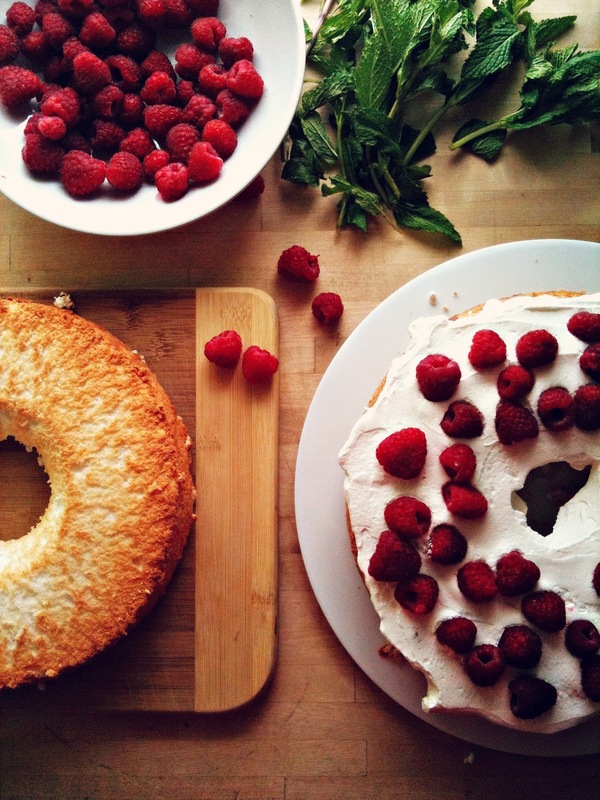 I used to ask my mom for angel food cake every birthday. She always made it with whipped cream and raspberry puree! Even today it is my favourite birthday treat and memory. Also, super useful tips. I'm glad I didn't purchase a bundt pan to use for this and bundt style cakes. Something told me to do a bit more research! 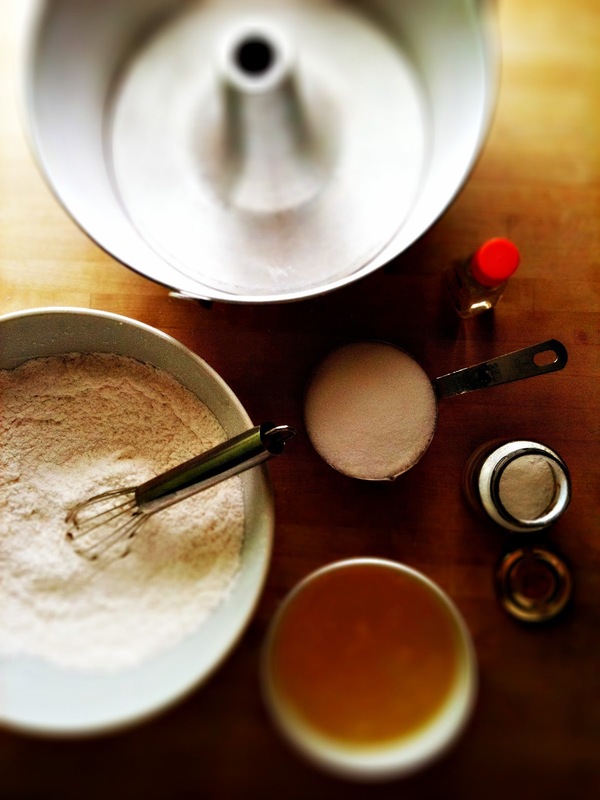 simple ingredients for such a beautiful cake! 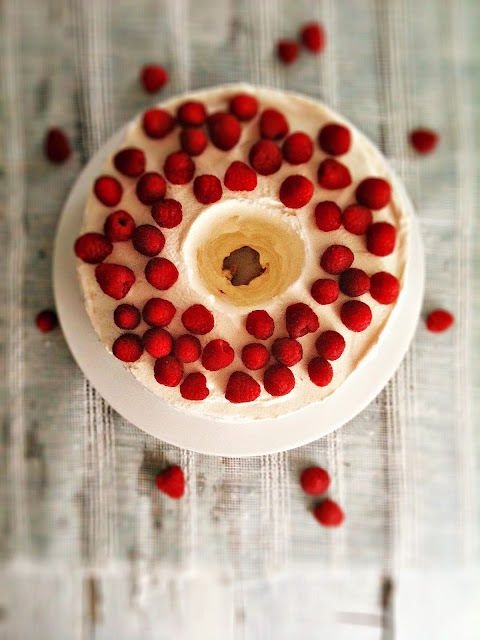 and, nothing like fresh raspberries on an angel food cake - pure and sweet. thanks for sharing your recipe! Hey Ren, this looks Fabulous as usual!!!! Make yourself some sinfully delicious home made hollandaise and you will have a good head start on surplus egg whites for sure. I'll be going out to get a removable tube pan soon I think! I have an angel food pan but not a fancy removable one like you are insisting on and since I'm addicted to hollandaise lately, a LOT of egg whites in my freezer! Thanks for this one! This looks so delicious, will have to get one of those pans for sure. And thanks for the helpful tips also! 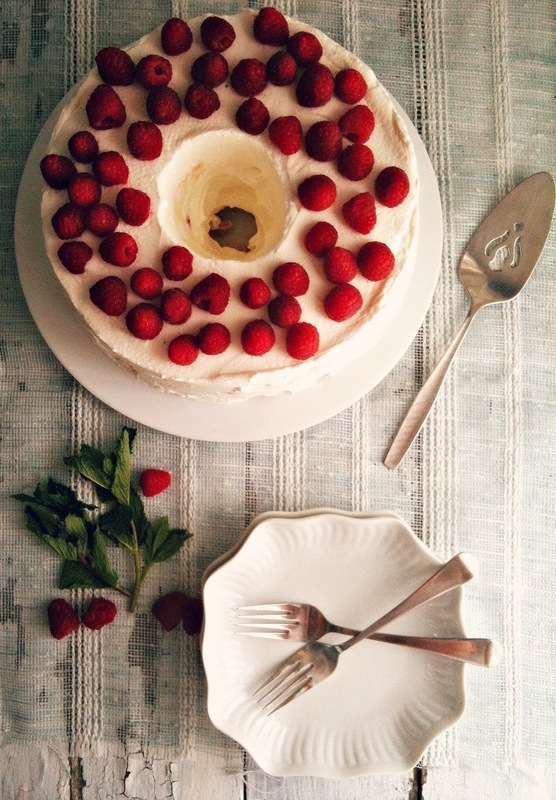 Hello from Lancashire in England :) I made your cake yesterday for a friend's birthday, substituting in some beautiful ripe strawberries instead of raspberries. Your instructions were perfect and it turned out looking as beautiful as yours. It was a real joy to eat, and everyone went in for seconds, despite having just polished off an Italian feast!